I purchased a few goodies some for myself and a cuddly toy each for my children. I wanted to give you an idea of what you can get in the gift shop for your money, I must say it's a typical tourist attraction with typical not your toy shop in town, prices. 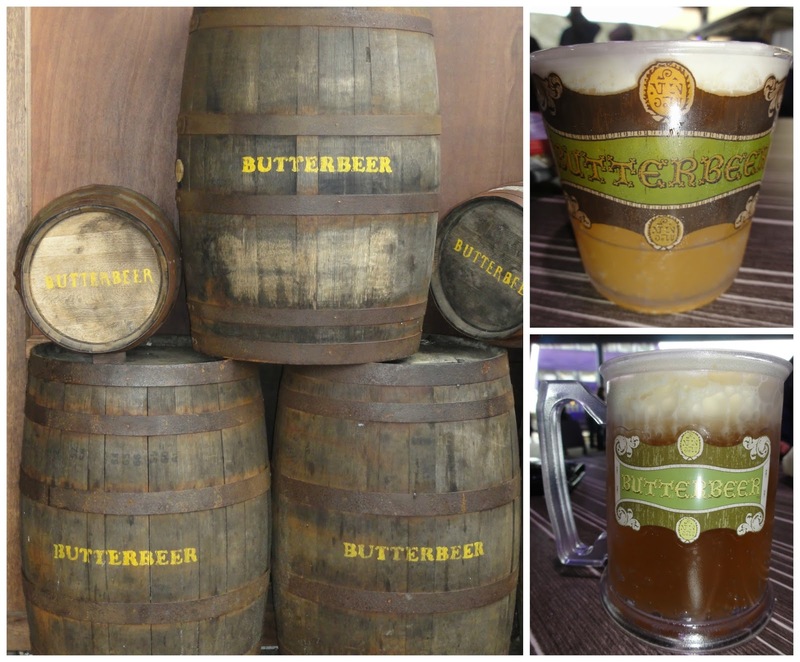 The ButterBeer was what I was looking most forward to trying when I visited Harry Potter studio's. It's only sold in two places in the entire world and one treat for any Harry Potter fan. This is available in three different cups. A plastic throw away cup for £2.95, the top plastic cup with Butterbeer on the front for £4.95 or below a frosted mug with handle and very similar to the one in the film for £6.95 - all come filled. My sister got the £4.95 one and I went for the more expensive one because I preferred the style. It's a lovely souvenir and a memory of the time you tried Butterbeer, living up north I'll never get the opportunity again anytime soon. I liked the butterbeer, it tasted like cream soda with the frothy bit having a hint of butterscotch to it which made it quite sweet. There is a great selection of little keyrings, this one set me back £6.95. I wanted a little souvenir that had a touch of all the houses within it. My daughter chose Pygmy Puff for her gift. This is seen in Fred and George' joke shop. An animal they bred themselves. This is £13.95 a little on the pricier side but one of the cheaper soft toys and since it's a once in a blue moon visit. The quality is great but the fluff is prone to falling out when pulled. My son originally chose the three headed dog which was quite pricey, he then went for Buckbeak which is cheaper at £19.95. It's quite big and really good quality and also stands. My son loves it and that's all that matters. I had my heart set on a whole list of stuff when I went but once there completely changed my mind. I did have my heart set on the Gryffindor cushion (that's what house I would be in if I went to Hogwarts) and settled for that, this was gift from my boyfriend as a belated birthday present. I didn't photograph it in all it's glory but it's quite a big cushion and will sit nicely on my bed. This costs £19.95, it's well worth the money, it's so plump and soft. The souvenir gift guide is a great read and full of information from the tour and the film with added pictures, etc. Bit pricey at £9.95 but great to read back on everything again and again. These bookmarks were free, I love reading so was happy my boyfriend picked some up at the till. Though I don't think I'll ever have 8 books on the go - think he went slight overboard. My daughters teddy was very cheap in comparison to her brothers so she got this lolly for her which she chose herself, this was £2.95. I can't believe she chose the dark mark I always knew she was a little devil. Labels: Butterbeer, Gift Shop, Harry Potter, Haul, Studio, Uk, Warner Bros.
You can't be British without loving Harry Potter! I love the keyring! I always pick up a keyring souvenir when I go somewhere new. I must visit the Harry Potter Studio at some point! Haha your daughter has great taste lol. The cuddly toys are cute and I really want to try the Butterbeer, I have a sweet tooth myself, xoxo. Haha, I'll just have to tag along there for the butterbeer lol, xoxo.